In his new book on startups Peter Thiel makes a provocative argument about the necessity of monopolies. He points out that in an environment of perfect competition, everyone is so busy competing just to stay even that they would end up with neither the time nor the resources to innovate. Perfect competition is a dead end as far as truly novel ideas go. There’s plenty of evidence of history to back up Thiel’s argument, and in no other case is the monopoly-innovation relationship evident as in the case of Bell Labs. Everyone talks about Bell Labs as the greatest cradle of industrial innovation in history but few talk about what birthed and sustained the cradle: the enormous monopoly and profits that AT&T enjoyed for fifty years. AT&T enjoyed this monopoly not just because they made superior products but also because they cut deals with the government that allowed them to always stay a step ahead of their competitors. It was this virtually unchallenged monopoly that allowed the telephone company to funnel its profits into the hallowed Nobel Prize producing milieu of Bell Labs. A similar example exists today with Google which has a monopoly on search. This monopoly brings them enough revenue so that they can entertain ten-year research visions and highly risky but potentially lucrative projects like self-driving cars and research into aging. 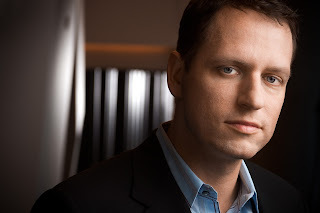 What the libertarian Thiel conveniently fails to mention however is that monopolies can use their surplus profits and resources for both good and evil. AT&T might have largely used their profits for fundamental research but Rockefeller and Vanderbilt used it to lobby the government and exploit workers. Similarly today oil companies spend an enormous amount of time and money in erecting massive lobbies in Washington. Of course, Rockefeller and Vanderbilt also used their enormous wealth for philanthropic purposes but the fact that they also sparked movements against low wages and worker exploitation and that Teddy Roosevelt was forced to break up the monopolies in 1907 speaks to how far out of hand the situation had gotten by then. Thiel does not mention all this; nevertheless he understands that the value of a monopoly is often measured by the time it exists and the reach of its power. That is why in his ideal world monopolies would be what he calls “creative monopolies” and what I will call “dynamic monopolies”. Dynamic monopolies are monopolies which are constantly challenged, not by perfect but by imperfect but still serious competition. Thus they have to constantly keep innovating rather than exploiting their power for political purposes in order to stay on top. Monopolies generally can be harmful, but dynamic monopolies can often be a very good thing. The value of dynamic monopolies however raises a more general question that is both far more provocative and more disturbing. It is almost a foregone conclusion that in the long view of human history many technological advances have been built on the backs and dead bodies of human beings. In his landmark new book “Empire of Cotton” for instance, historian Sven Beckert talks about the enormous evil of slave labor that allowed capitalism to become a bedrock of Western and eventually all of civilization. The Romans developed superior engineering and the Egyptians built the pyramids backed by thousands of slaves and peasants. Look at every major technological advance in history and you would be hard pressed to find one that did not involve the exploitation of at least some class or group of people. That is why we rightly have government laws which protect the exploited and the disadvantaged. That is why we rightly have human rights organization and the Red Cross. Nevertheless, the principle that innovation and novelty can only arise from some kind of asymmetry of wealth, distribution or work seems to be a mainstay of history. I realized however that there is a remarkable correspondence between this principle and a most fundamental aspect of science and nature – the laws of thermodynamics. One of the essential truths about life on earth (and presumably everywhere) is that it presents a condition that exists far from equilibrium. In technical terms, the free energy change of living systems is not zero; a value of zero for the free energy only holds for systems at equilibrium. Now existing at equilibrium is a very bad thing for a living creature. In fact as the old saying goes, the only living system at equilibrium is a dead system. Death is the condition of true equilibrium; it is only by driving a system away from equilibrium that living beings can be born, move around, think, prove theorems and write sonnets. All the richness of life comes about because it's trying to be as far from equilibrium as possible. Just as perfect equilibrium can lead to death, so it seems that perfect competition can lead to stagnation of innovation. Just as we need asymmetry in the thermodynamics of life in order to thrive and even exist in the first place, so it seems that we need asymmetry in the evolution of markets in order to sustain technological progress. That fact leads to an argument in favor of monopolies. But what’s even more essential to keep in mind is the ever-changing nature of life. Life can maintain its essential asymmetry only if old life makes way for new. If old life refuses to die it will lead to another condition of equilibrium which will be static instead of dynamic. Similarly technological innovation can maintain its edge only if old monopolies turn over on a reasonably rapid basis - perhaps over periods of ten to twenty years - and make way for new ones. Hence the need for dynamic monopolies. And hence the need for government laws that enable such entities. Even the fundamental laws of thermodynamics make a case for them.